Digi-Pas® R&D composes a team of multinational, interdisciplinary and highly specialized professionals focusing on the development of core capabilities and competencies within niched domain expertise of precision digital levelling, two-dimensional surface plane angular measurement/alignment, and proximity access security technologies. We relentlessly perform R&D activities to innovate global-leading intelligent angular measuring instruments and eGeeTouch® smart locking devices in contributing to the advancement of the precision engineering and consumer solutions, particualry to the automotive, aerospace, medical, energy, building, semiconductor and consumer electronics industries. In 2009, Digi-Pas® pioneered the world's-first dual-axis precision digital level and in 2011, we further pioneered the world's-first 2-axis intelligent machinist level that have greatly simplified any high precision machine levelling and planar angle measurements tasks. In 2012, we sustained our innovation by presenting the world-first Digi-Pas® 2-axis ultra-precision inclinometer at JIMTOS in Tokyo. As leveling and angular measurements are vital functions for precision equipment installation, machine alignments and metrology in many industries within the precision engineering cluster, field engineers are often constraint by using traditional spirit bubble levels or single-axis digital inclinometers to accomplish these basic leveling tasks one axis at a time and tedious trial-and-error iterations. In fact, modern precision leveling, angle measurement and alignment tasks essentially involve a plane or two dimensional (i.e. 2-axis), while conventional leveling tools/instruments are limited to single axis, Digi-Pas® technology and innovation have empowered many engineers by eradicating constraints associated with using single-axis instrument. Further, at higher precision and wider range of angular measurements, conventional single-axis inclinometer becomes susceptible to cross-axis error. Digi-Pas® 2-axis ultra-precision inclinometer embedded with advanced MEMS and proprietary compensation process technologies effectively prevents cross-axis error and simultaneously displays tilted-plane surface angles with greater accuracy. In 2014, we launched eGeeTouch® NFC smart locking device that utilizes state-of-art proximity access security technologies and it was the world's first of its kind, which subsiquently receiving numerous Innovation Awards from Japan and USA. These smartlocks effectively resolve disadvantages associated with conventional locks, providing enhanced security as well as a truely hassle-free expereince to users. The novel innovation of eGeeTouch® smartlocks wirelessly link to the internet to the Cloud-computing infrastructure, deploying highly secured NFC technology via smart devices such as smartphones, smartags etc., validated us as the world pioneer in introducing Internet of Things (IoT) into travel luggage industry by prestigeous world's largest Consumer Electronic Association (CEA) at 2014 CES Unvieled New York. eGeeTouch® smart padlock tracks, WHO, WHEN & WHERE an access was made providing an audit trail (audit log - a security relevant chronological record), containing documentary evidence of the sequence of access history which is a highly useful new feature unmatched by any conventional padlock. For more info, please visit www.egeetouch.com. Digi-Pas® continues to collaborate with world-leading metrology laboratories and product's accuracy performance to specification has been verified by accredited 3rd party independent certification bodies in USA, Japan, Germany and UK traceable to NIST, JIS, DIN & UKAS. In over a decade, we have attained over 30 Intellectual Property (IP) rights (incl. patents, registered designs and trademarks) in U.S, Japan & Europe. Our product development roadmaps have unveiled numerous world-first innovative new products in leading international tradeshows. For over a decade, our R&D have been strategically focusing on applied research in the area of advanced technology deployment to electronic devices based on the concept of disruptive innovation creating radically new products that seek to replace thier respective conventional products and in collaboration with many world-leading research institutes have successfully developed and turned cutting-edge research findings into global-leading new products. Traditional spirit 'bubble' level, pendulum-based or servo-driven digital levels and inclinometers were often constrained with (i) single axis, (ii) narrow angle measurement range, (iii) large footprint/size, (iv) inability to withstand high shock/impact and (v) mechanical moving parts that degrade quickly due to wear-and-tear. Single-axis inclinometer is also susceptible to cross-axis error particularly when measuring at larger angles and at higher precision. However, precision levelling, angle measurement, alignment and surface flatness profiling tasks essentially involve 2-dimensional plane rather than two independent orthogonal single-axis lines. Digi-Pas® 2-Axis precision inclinometer utilizing advanced semiconductor MEMS technology, with NO-moving part, provides simultaneous 2-axis and wide angle measuring range capabilities unmatched by those traditional single-axis 'bubble' levels, pendulum or servo-based electronic inclinometers. 2-axis MEMS technology enables simultaneous 2D (X-Y plane) leveling and angles measurement (i.e. pitch & roll), completely eliminates tedious trial-and-error (i.e. going back-and-forth taking reading one-axis at a time) experienced when using single-axis levels to align precision machines/objects. No costly need for owning 2 units of single-axis digital levels to do the same task as one unit Digi-Pas® dual-axis. i.e. effective & time saving. The repetitive yet monotonous trial-and-error activity of using single-axis levels is also time-consuming, non-productive and promote boredom that often succumb engineers to resort for compromising works. Digi-Pas® 2-axis MEMS driven inclinometers are compensated and calibrated for non-linearity and wide operating temperature variation utilizing company's proprietary advanced manufacturing patented processes. Angular accuracy and stability performance over a very wide measurement range are externally verified by numerous accredited 3rd party independent certification bodies traceable to NIST, UKAS, DIN & JIS. i.e. accredited & reliable. Because of its 2-axis, wide angular measuring range and vibrometer functions, Digi-Pas®inclinometer is more than just a leveling tool. It is an instrument that provides a comprehensive solution for precision machine leveling, tilted-plane angle measuring, machine structural stability diagnostic and alignment needs. Digital Bull’s Eye with numerical/graphical data and a built-in VibroMeter enable machine installer to track/guide alignment in real-time and instantly verify positional stability of the levelled/aligned machine by comparing machine's status profiles before and after setting up. Dual axis smart Bull's eye also prevents parallax error that is prone to experience when viewing the 'bubble' of a traditional spirit level, i.e.accountability & quality works. Wireless/USB connectivity to PC/mobile device enables field engineers to perform with ‘one-man-operation’ when conducting levelling and machine alignment tasks, i.e. speedy & cost saving. Digi-Pas® DWL-5000XY tilt-sensor module survived over 3,000g to 6,000g Shock/Impact Test in both X&Y directions thus makes it possible to be integrated in equipment/structures for high shock/impact applications, particularly in hostile environments inoperable by conventional pendulum or servo-driven tilt sensors. There is no moving parts inside the sensor module. In any precision measuring instruments and metrology, accuracy and reliability are very important aspects to users. Readings from an inaccurate measuring instrument/tool would result in making a faulty decision and in many cases could have unintended consequences. Digi-Pas® 2-axis digital leveling instruments are built with advanced MEMS Sensor Technology and precisely calibrated for non-linearity for its entire measurement range using high precision computer numerical controlled equipment with resolution of 0.0001° (< 1 arcsecond). The accuracy and repeatability conformance of these highly specialized calibration equipment are further tested and periodically verified with ultra-high precision angular rotary systems (<0.01 arcsecond), as well as laterally compared against measuring data from world-leading accredited test and certification bodies in Japan, USA, UK and Germany, traceable to NIST, JIS, UKAS & DIN. Series of Calibration Certificates obtained from these certification bodies are obvious evidences of our product conformance to specification. This has demonstrated Digi-Pas® capability and its leading-edge technology to develop and manufacture world-first dual-axis high precision angular measuring instruments. The digital technology adopted has enabled Digi-Pas® angular measuring instruments to be compensated for wide operating temperature variation utilizing Digi-Pas® patented advanced calibration processes (US Pat. No. 9,459,121 B2). Programmable precision temperature and humidity chambers are also utilized to calibrate various Digi-Pas® product lines for a range of -20°C to +60°C. This has enabled these products to reliably withstand stringent operating environment in many harsh terrains ranging from building skyscrapers in the desert of Middle-East to the constructing of oil pipes, tunnels and bridges in the freezing cold countries such as Canada, the Nordic and Russia. It is well known that a typical characteristic of MEMS tilt sensor inherently contents nonlinearity within its angular measuring range at any fixed operating temperature as well as when temperature changes. These nonlinearities affect angular instrument accuracy becomes even more significant when dealing with ultra-precision angular measuring system. Digi-Pas® employs our proprietary calibration processes utilizing advanced calibration technologies to stabilize multiple variables contributed by material properties, components and electronic system. Hysteretic nonlinearity and cross-axis error have been controlled and managed to a level negligible or within product’s specification. Calibration and testing of precision angular measuring instrument become very challenging at higher precision, wider measuring range and multi-axis. Test equipment’s linearity compounding error within entire measuring range and testing processes such as Swash errors become major impediments for establishing a responsible budget on measuring system uncertainties of no less than 95% confidence level at a coverage factory of k=2. Over the years, Digi-Pas® has relentlessly made continuous improvements and closely collaborated with global leading 3rd party accredited test laboratories in USA, Japan, UK & Germany and world-leading National Metrology Institutes under Bureau International des Poinds et Mesures (CIPM MRA) to successfully test and verify with rigor our products performances to specification traceable to NIST, JIS, UKAS & DIN for international conformity assessments. These collaboration and cooperation have benefited many of our users in USA, EU and Asia to conveniently sending their instruments for annual calibration and test at a nearby laboratory for shorter lead-time and lower cost as these labs are in a close proximity to their respective geographical location. Digi-Pas® patent (US Pat. No. 9,459,121 B2) on methods and apparatus for calibrating ultra-precision 2-axis simultaneous angular instrument (of < 1.0 arcsec accuracy) utilizing nano-technology equipment addresses and resolves critical limitations and shortcomings inherent when using conventional single-axis rotary table or laser interferometer to calibrate and test dual-axis precision digital anglular measuring instrument by taking one axis at a time. In leveling applications, the primary aim is to align the surface plane of a physical object such as a machine, equipment or engineering structure to a reference leveling point, commonly known by tradesmen as ‘zero level’. This ‘reference level point’ is a planar position tangent to the center gravity of earth i.e. refers as Earth Datum. This ‘reference level point’ can then be transferred into a leveling instrument. Subsequently, this leveling instrument is used by industrial engineers to set a particular machine/object surface to a required leveling position. The process of transferring Earth Datum to a Digi-Pas® digital leveling instrument is referred as performing "Absolute Leveling Setting". By performing Absolute Level Setting on Digi-Pas® digital levels, it also effectively removes any offset resides in the instrument and thus resetting the instrument’s reference leveling point to coincide with earth datum. Similarly, "User Self-Calibration" is another alternative process to transfer Earth Datum and automatically store the reference leveling point into a Digi-Pas® digital leveling instrument. What happen to the accuracy of Digi-Pas® leveling instrument if it drops? Likewise to any precision measurement instrument/tool, mishandling such as dropping a digital level to the floor or storing it outside the specified temperature range, could affect its accuracy. This is due to structural deformation resulted from mechanical shock on impact when dropped and physical micro-dimensional changes (e.g. non-linearity) resulted from thermal expansion or contractions when storage temperature exceeded maximum specified range. However, unlike traditional ‘bubble’ spirit levels and many other digital levels in the market, all Digi-Pas® digital level is built with User’s Self-Calibration feature. This feature empowers users to perform their own calibration without the need to sending to 3rd party testing laboratory for inspection when minor mishandling the device. At user’s convenient work site or field work, User’s Self-Calibration can reliably reset the Digi-Pas® digital level back to factory preset accuracy whenever in doubt with the accuracy. For further information on Digi-Pas® digital level , please refer to FAQ at the following web-link: http://www.digipas.com/support/faq. Figure 1 illustrates three typical poor surface finishes of conventional rectangular surface four-point contact base. The unstable surface-to-surface contact causes 'rocking' which results in measurement inaccuracy derived from inconsistent readings. A common practice to improve the outcome under such constraint is by taking more samples to obtain an averaged reading. However, this time-consuming and repetitive activity often promotes boredom that succumb engineers to resort for compromising works, especially when the instrument is located at some distance. Often, dents are easily generated on smooth metal base area of an instrument resulting from rough handling. A protruding dent formed at any location near the middle of a 'perfectly flat' metal base simply causes rocking which results in measurement error or inaccuracy. To minimize these errors, Digi-Pas® instrument metal surface base has been deliberately designed and machined to form a concave 4-points contact base specifically target to prevent rocking caused by small protruding dents or foreign particles formed at the center of device’s base. Figure 3 illustrates the inferiority of a 'perfectly flat' base of conventional instruments against the improved design of Digi-Pas® concaved 4-point base when small dents/particles exist at the center of device’s base. It is obvious that small dents or particles exist near the middle of the base shall not affect stability of Digi-Pas® instrument as it is supported by both ends having precisely machined stable contacts to the targeted measurement surface. On the other hand, dents formed at the both ends of the instrument may not necessarily cause significant rocking. When dents happen at these both ends, an offset value/reading caused by these dents can be easily removed using Digi-Pas® calibration or Absolute Level feature (see “Accuracy Performance”). In contrast, a protruding dent formed at the middle of the device’s base destabilizes the device with severe rocking during measurement which cannot be resolved by using calibration or Absolute Level feature. This phenomenon does not only affect the instrument's initial offset value, it also affects the repeatability of measurement reading. Thus, the contact surface approaching the base center of instrument is deliberately being designed with a concave profile to minimize the above issue, providing improved stability of measurement readings as well as enhances accuracy of the instrument. When a 3-point contact base leveling instrument is placed on either flat or uneven surface object (e.g. typically machined metal surface) as shown in figure 4 and 5 respectively, the three-point frame serves as a triangle-plane platform for supporting the weight and maintaining the stability of the instrument. It provides maximum stability and strength against downward forces and horizontal forces as well as movements about horizontal axes. With the sturdy three-point stand, a most stable 3-point-to-surface contact can be established without rocking and thus achieving consistent leveling readings of the two-dimensional measuring surface. Any angular deviations on the surface area is detected by Digi-Pas® 2-axis inclinometer as sensitive contact points touch on a particular section of uneven surface area. For using Digi-Pas® 2-axis inclinometer to level an object having a very rough top surface, the 3-point harden/titanium screws can be temporarily removed and use the flat base surface to naturally average the rough surface. Absolute Level Setting is required to be performed immediately after changing the base to ensure the instrument maintains its reference accuracy. However, in high precision leveling, angular measurement and surface profiling tasks usually involve high quality flatness and smooth surfaces such as granite and metal alloy machined surfaces. Hence, 3-point contact base is still a better choice. The quality of Digi-Pas® products are calibrated for level (zero datum at 1 arcsec or 0.00027°) and plumb (90.000°) & tested for high precision and accuracy to conform to product technical specification traceable to NIS, JIS, UKAS & DIN. 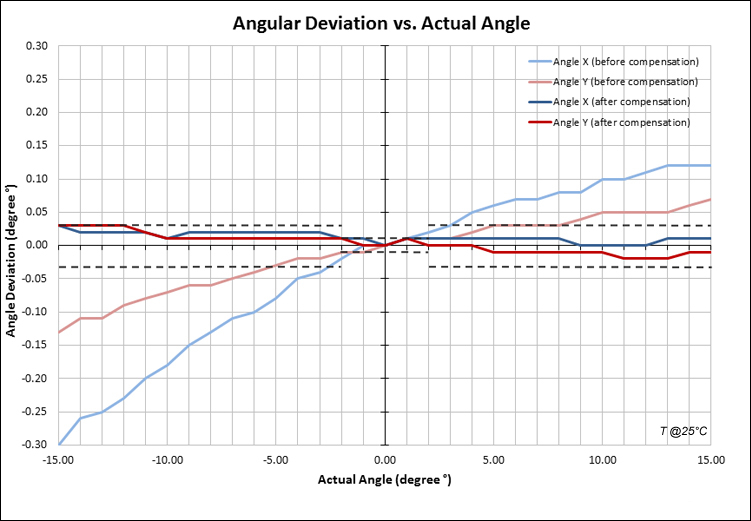 Angular resolution of 0.03 arcsec and accuracy for < 0.3 arcsec can be tested for Digi-Pas® product specification conformance. Sensor non linearity such as cross-axis error can be verified for full 360° with great confidence. Digi-Pas® ultra-high precision inclinometers with resolution & accuracy of 1 arcsec. (5µm/M) are calibrated and tested using the straight edges having flatness of measuring surfaces according to DIN874 Class 00 and DIN876 Class 1. The DIN874 surface flatness standard is utilized as an added means to ascertain Digi-Pas products are verified for conformity to technical specification traceable to DIN within Digi-Pas laboratory as well as before sending them to the 3rd party independent calibration and test provider laboratories. Dynamic displacement and acceleration for vibration measurement calibration and test system are utilized to calibrate the relative vibration magnitude of Digi-Pas® Precision Digital Level. Very high magnification resolution of 1000X vision imaging system is used for Quality Assurance & product specification conformance in the manufacturing of Digi-Pas® products. Length & flatness dimensional measurement resolution is 0.1µm and measurement accuracy is (1.5 + 3L/1000)µm where L is the measurement length. The Nikon high precision metallurgical measuring microscope capable of magnifying up to 1.500x incorporates with digital imaging and vision processing metrology. The high resolution image and non-contact Z-height dimensional measurement are useful features for Digi-Pas® laboratory applications such as Crack & Failure Analysis or Surface Analysis. Digi-Pas® product area calibrated and tested to reliably withstand operating in stringent environments. Each product is compensated to operate in accordance to full operating temperature range. Digi-Pas® products are subject to accelerated temperature test for reliability and performance conformity to specification utilizing Taibai Thermal Shock Chamber. Utilizing world's premier Tektronix's & Agilent's advanced and comprehensive test instrument portfolio in aids for the design, development and test of Digi-Pas® embedded electronic systems. The E4404B Agilent ESA-E Spectrum Analyzer (9kHz to 6.7 Ghz) has been effectively used for characterizing frequency response and noise performances and compliant Bluetooth transmitter measurement of Digi-Pas® embedded systems. * in collaboration with A*STAR (the Agency for Science, Technology and Research), a Singapore's lead government agency dedicated to fostering world-class scientific research and talent for a vibrant knowledge-based economy.